While St. Patrick’s Day is exactly a week away, you may be celebrating this weekend with a night on the town or better yet, a party at your own home. This Saturday and Sunday, many cities will be holding their St. Patrick’s Day parades and festivals. After attending one of these events, invite some friends over for a St. Patrick’s Day party. To help you prepare, I’ve put together some tips on how to throw a St. Patrick’s Day party. Even if you are planning a quiet night at home with the family, you can still get a little festive with these ideas! Invite friends to wear green to the party. As the party host, make a shamrock pin with felt, crochet or fabric yo-yos. Wear some lovely green and gold beaded jewelry. Replace your outdoor/porch light with a green-tinted light bulb to help direct guests to the right house. Hand out homemade “Kiss me I’m Irish” buttons to party guests, like the one shown above. The buttons make for fun party favors. You can also use the buttons as prizes for party games (see end of list). Make a simple centerpiece with a square box turned into a Leprechaun Hat. Search through old gift boxes for an appropriate sized box. Turn the box over so that the lid forms the brim of the hat. Paint the box bright green. Once dry, remove the box from the lid and paint a band of black around the top. Add a square gold buckle on the front. When dry, replace box on lid. For an even simpler centerpiece, make a Leprechaun’s Pot of Gold. Fill a small black cauldron left over from Halloween with gold chocolate coins. For a bit of fun, paint a rainbow on a large rectangle of paper and hang over the pot of gold. Use a small heart rubber stamp and green ink to create shamrocks for adorning napkins, paper plates and other party accessories. Stamp three hearts with the points nearly connected and painted a curved line for the stem. Cut out felt shamrocks in green, orange and white (the colors of the Irish flag), punch small holes on each side and string onto twine to create a St. Patrick’s Day party garland. String green Christmas lights from the walls or wrap around an indoor tree. Create a green party punch. In a large bunch bowl, mix 1/2 gallon lime sherbet with 2 liters of ginger ale or lemon-lime soda. For those drinking at the party, you can serve a traditional Irish beer, such as Guinness, and a cheap, light beer which you can dye green with a drop or two of green food coloring. Make shamrock cookies with green icing. If you don’t have a shamrock cookie-cutter, connect the points of three hearts together and add a small stem before baking. Get competitive with an Irish Trivia/St. Patrick’s Day party game. For example “When was the first St. Patrick’s Day Parade?” The team with the closest answer wins. Answer: The first St. Patrick’s Day Parades were not in Ireland, but in Boston (1737) and New York (1762). This photo tutorial from Chris Pickup of Pickup Some Creativity shows you how to create a banner of ruffle hearts with scrap fabric. This type of fabric banner is often called bunting. If you love to sew, whip together some ruffle hearts for low-cost Valentine’s Day decorating. I also think this would be a cute idea for a birthday party, anniversary or romantic dinner. See the tutorial here. While paper maps are rather antiquated in the age of GPS and smart phones, they are nonetheless prevalent and carry a certain nostalgic attraction. Maps are intricate, colorful and can represent a beloved location. Instead of tossing an old map, use the paper for a variety of craft projects. Maps make a great background for scrapbook pages or cut out shapes for embellishing cards and other papercrafts. You can even use the maps as labels for your travel photo boxes. If you love to travel, maps are the perfect decorating theme. You can frame, use to decoupage a serving tray or turn the map into coasters sealed in resin. Custom Couple Silhouette– Guest contributor Becky Kazana shares how to create custom silhouettes and offers a map as one material. A couple silhouette can be a gift for Valentine’s Day, an anniversary or birthday. Map Ornament– Wrap foam balls in maps to create ornaments for Christmas and other occasions. Yesterday, I wrote about how you can make festive Christmas house crafts for a therapeutic holiday activity. I focused on stockings and garland as two of my favorite holiday decorations. Today, I want to share some of the best ideas I have found on the web for making your own Christmas house crafts. Glittering Christmas House from shabbynest.blogspot.com – This cute framed piece is literally a christmas HOUSE craft, haha! 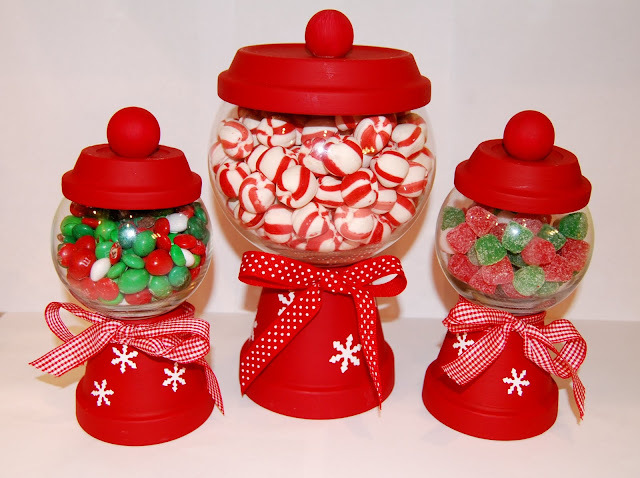 Christmas Gumball Machines from cjaneblog.blogspot.com- These are a great way to display colorful Christmas candies using inexpensive clay pots. Paper Christmas Trees from elizabethannedesigns.com- A step-by-step version inspired by Martha Stewart, using household items to create the circles instead of an expensive circle cutter. Yay for smart and frugal crafting! Yarn Christmas Trees from pretty-ditty.blogspot.com- Use yarn and foam cones to create adorable mini Christmas trees. In Great Decor in a Flash Without a lot of Cash, you will find 29 craft projects for low-cost wall art and other decorative accents using STYROFOAMTM brand foam. For under $20, you can create a whole wall of artwork. The eBook even includes ideas for how to reuse materials you already own, such as old t-shirts, or use found objects from nature to create art. Learn more and download the eBook here. Creative Home Arts Club has supplied us with a beautiful collection of holiday craft projects in the Creative Ideas for the Holiday Home eBook. This eBook is free to download and print. You will find 20 craft projects, including 10 Christmas Crafts and 7 fall craft projects perfect for Thanksgiving decorating. Metallic Leaves Wreath (page 18)- This beautiful decoration for fall welcome guests into your home. Autumn Leaf Dinnerware (page 22)- Set your autumn feast with this beautiful dinnerware painted with colorful falling leaves. Christmas Tray Chic (page 46)- Paint and stencil versatile pieces that can be arranged in countless ways to fill all of your entertaining needs. Holly Votives (page 37)- Add clay accents to a plain candle votive for a pretty decoration or holiday gift. Satin Tucked Balls (page 55)- These easy to make ornaments are a great way to use up scrap fabric and perfect for holiday gift exchanges. Glass- Pick up plain glass ornaments and embellish with acrylic paints. For one idea, cover the ornament with gold paint and then add green holly leaves with little red berries. For clear glass ornaments, you can even swirl paint inside the ornament for a fun, marbled look. Fabric- Use holiday fabrics to create fabric yo-yo’s. Add a ribbon or a loop of ric-rac and you have a cute ornament for Christmas. Felt- Felt is a great material for making ornaments. You can cut out, stuff and sew shapes such as santas, bells and even partridges. Or create flat felt shapes such as wreaths. Use these craft ideas to decorate your Thanksgiving table. Pick up simple burlap from the garden center (the burlap with the looser weave looks better) and use it to create a table runner, place mats, or a table cloth. The edges can be kept a little frayed for a rustic look great for autumn gathering. Place burlap underneath your Thanksgiving rolls in the serving dish or bowl, letting a little come up at the sides. For a nice table decoration, fill vases or, better yet, tall glassware with colorful leaves of the season. Dry the leaves between sheets of paper towel before using. Take simple, clear votives and decoupage colorful leaves to the outside with your preferred adhesive (mod podge would work great), or for an easier shortcut, just tie them on with a bit of twine. Punch a hole in small pumpkins to serve as candleholders for your table. Turn a craft gourd and foam filled into a fun Thanksgiving turkey with colorful foam feathers. This turkey makes for a fun craft for kids. Cut off the top of a bigger pumpkin to serve as a vase for an autumn bouquet. Paint a band of strong adhesive around the middle of a pumpkin (or candle) or use double-sided tape. Roll the pumpkin in an assortment of dried beans or lentils for a decorative, autumn look. Instead of place cards, write the names of dinner guests on tiny pumpkins or gourds. You can also crochet some squash and gourds with this free crochet pattern. You can also use those lentils as a kind of candle-holder. 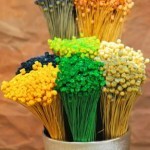 Fill a shallow bowl with different colored lentils, and nestle short candles into the lentils. Take foam balls and coat with glue. Roll in the seeds, beans, or lentils. For different ideas for these “natural ornaments,” see this project. You can display in a shallow bowl on the table instead of hanging. Pomegranates and cranberries are wonderful additions to a fall spread. Fill a tall, clear vase with fresh cranberries. You can add branches, bark, or cinnamon sticks. Fill a fewer shorter vases only with cranberries and water, and float candles on top. 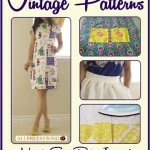 Don’t forget to check out the Thanksgiving Turkey Time Aprons project. Can you help this reader create a silk flower angel? Sounds like a great craft for Christmas. Make a whole set in coordinating colors to adorn your Christmas tree. I’m looking for a pattern for angels made from silk flowers. You put glitter on the edges of petals & leaves, turn the blossom upside down, put a wooden bead for the head, add hair and a halo. I thing the leaves are used as wings. Thanx so much! Post your answer in the comments. Best answer will win a special craft prize! 5. Use Natural Materials– Filling your home with lots of greens and reds for Christmas can become distastefully garish. Balance out some of the bright colors with natural materials, ideally collected from walks around your home. Cover foam balls with dried seeds for display in a shallow bowl or create natural ornaments with the same technique. Use natural dried grapevine as the base for a wreath, garland or door swag. Then add pops of color with real or crafted poinsettias, made out of craft foam, felt or crochet. You can also spell out holiday words such as “Joy” with craft foam or simply use painted brown bags. I also love the idea of using collected pine cones in your Christmas decorating. For spectacular outdoor decorations in colder climates, try making icicle luminaries by freezing holly berries, pine branches and lemon in water. You can also make an ice wreath with a bundt pan in this same way. 6. Bead Your Christmas Presents- Homemade jewelry makes for an impressive yet surprisingly easy-to-create Christmas present. Invest in a number of good-quality beads and make a number of small beaded projects, such as bracelets, cell phone charms, key-chains and pins. These smaller gifts are great for stocking stuffers, hostess gifts, gift exchanges and party favors. You can invest a bit more time in beaded jewelry gifts for close friends and family, with special techniques such as intricate beading, stamped metal, rolled paper beads or colorful friendly plastic pendants. Stamped metal offers great opportunities for personalization with your recipient’s name but you can also personalize with alphabet beads. If you are ambitious, you can try your hand at making glass beads with home kits using your microwave. Homemade fused glass is especially “hot” right now, excuse the pun. 7. Make Your Own Ornaments- Create a theme for your Christmas tree this year with a set of matching ornaments. Plain glass ornaments can be purchased inexpensively online (especially well before Christmas). Paint the ornaments or dip in translucent dye. You can even remove the metal hardware and swirl paints on the inside of the glass ornament for an interesting marbeled look. Throw an ornament-painting party with friends or family for a fun time and lasting memories to display on your tree. 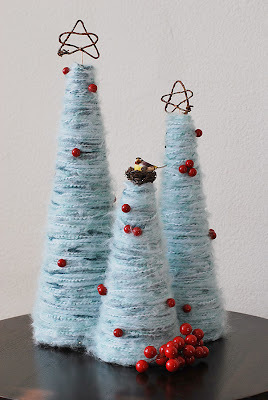 Alternatively, you can make a set of Christmas ornaments with foam balls, recycled Christmas cards, yarns or threads. A set of delicate stars crocheted in metallic thread would look fantastic on your tree. Coordinate your ornaments with the rest of your homemade Christmas decorations.